Would you believe it's only 1 more sleep until the big day! All the presents have been bought,wrapped and tagged, the fridge is crammed with enough food to feed a small army and the dining room is kitted out in decorations. However there is just one very important task still left to do and that is to sprinkle the reindeer dust on the front lawn, then put out a little snack for Santa and Rudolph. 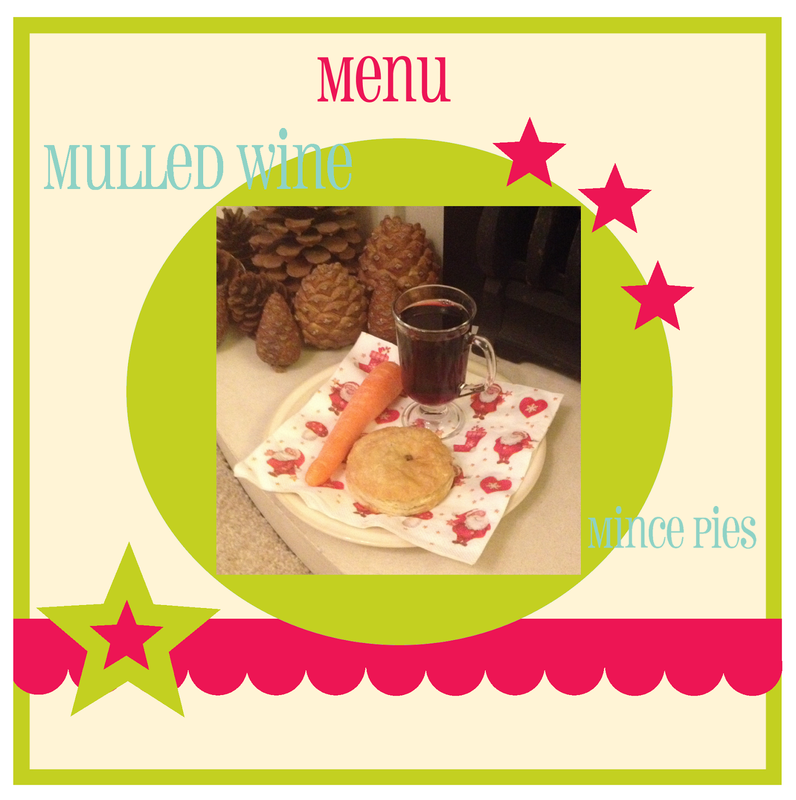 I was told that Santa rather enjoys a mince pie and a little glass of mulled wine. Rudolph on the other hand would prefer a carrot, because as we all know carrots help you see in the dark lol. This is a picture from last year and this time I decided to use Sarah's FREE Tinseltown digi kit. Never attempted this before so I'm a bit rusty lol. 1 - Copy the scallop border from the red recipe card, then paste it onto the menu card. 2 - Create a circle (I used GIMP) and fill it with the green colour. 3 - Open up the picture file into GIMP, copy and paste the image onto the menu card. Then reduce the size of the image to fit into the circle. 4 - Next add the sentiments. 5 - Using a star image add 3 small stars around the circle. 6 - Again using the star image but add a large star on top of the scalloped border (I changed the colour to green), then add a smaller red star inside. 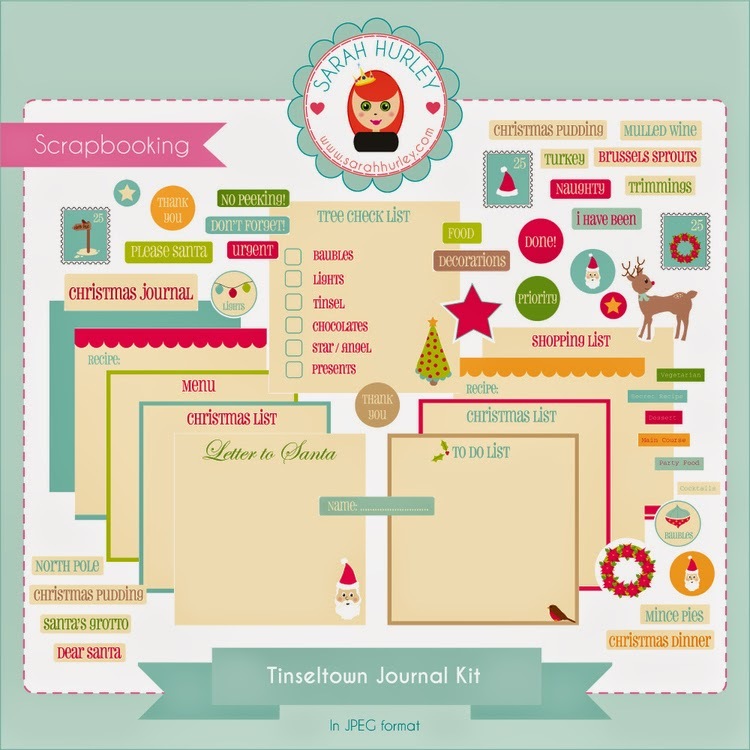 Tomorrow Sarah will be kickstarting the day then Jaine will be showcasing her Documented December layout. From 12 noon the design team will be posting throughout the rest of the day so please pop by if you can and perhaps leave a little Christmas cheer!